These courses offer a theoretical and practical reflection on the study of the body; these practices are not less artistic in themselves but serve to reinforce the artistic practice. The body is the main instrument of the dancer, and by learning to know it well and use it well, a dancer can work better with it and prevent injuries. 4-days a week, the day starts with a session of yoga, pilates or Feldenkrais. The other courses are offered in workshop formats. Some teachers work with Do-Zen, based on Oki yoga and Iyengar yoga, adapted towards the needs of dancers. The main goal is to offer a better insight in and knowledge of the body, at the same time as the full body is strengthened and made more supple. It aims to create an open state. Other teachers work with Hatha yoga, in which specific combinations of physical postures and breathing exercises bring quietness for the mind, warm up the body and raise the consciousness of the alignment of the body, and bring power into the limbs and joints. The yoga class increases the consciousness of the individual body and the limitations that can be worked on. For the students, it is also a warm-up an anchoring point. When practiced consistently for a long time, it is an important factor in injury prevention. The shiatsu workshop takes place in the 3rd year. The study of shiatsu offers a different perspective for understanding the functions and movement dynamics of the body. The classes focus on a.o. concept of hara (body center), the concept of yin and yang, the relation between movement and breathing, the dynamics of food and its effect on the physical and mental conditions. Shiatsu helps the students gain more insight into their mental and physical condition, to support the demanding dance training. Next to the intensive yoga training, P.A.R.T.S. introduces a limited number of different physical training practices. Diversity can be enriching and produce additional experiences in the development of physical and movement knowledge. Different body types can need different approaches of physical and movement research. This diversity helps the students to make an informed choice of what is best for their body. Anatomy classes are organised in the 1st and 2nd year. The classes provide a global insight into the skeletal, muscular, visceral and neurological systems of the human body. Special attention is given to the interactions between these systems, especially those that are important for dancers. Another focus is on anatomical knowledge that can help prevent injuries. After a series of theoretical classes, this knowledge is practiced in the Experiential Anatomy classes, which work with observation, directed touch and imagery to clarify each student’s understanding of their unique physical structure and patterns of moving. This research uses principles from mindful physical practices, such as the Alexander Technique, Ideokinesis, Anatomical Release Technique and Body Mind Centering: slow sensory investigations leading into full-bodied dancing where new embodied awareness and insight can be applied within improvisational tasks. The central aim of the course is to develop a personal discourse about one’s musical experience. This happens through listening sessions on specific themes (classical, jazz, opera) in which one speaks about the main parameters of music, its performance and listening experiences in a general terminology, rather than in musical jargon. The course is constructed over two years. In the 2nd year, the class is linked to the duet task (see personal work): students select a piece of music from a list of possibilities to make their choreography. The music analysis classes study and contextualise these works. In the 1st and 2nd year, there is a weekly collective singing class. The classes train the individual voice and breathing, group singing, the experience of producing music. A first approach focuses on relaxation and breathing, letting the voice vibrate through the body and the head, letting the voice be felt as a physical instrument. This makes a strong connection with the approaches of the body during the dance classes. A second approach is in the experience of singing though improvisational techniques (rhythmic, modal, words) which steer away from the pressure to sing ‘correctly’. A last approach focuses on the singing of polyphonic repertoire. In the 3rd year, there are optional classes where students work in very small groups of three, outside the regular class time. Here, they can focus on the individual level of the student and work on improving it. In the 1st and 2nd year, every week a rhythm class is organised. The class starts with building up a basis for a common approach of rhythm. With the help of the body, clapping, breathing, voice an a syllabic system (all organic approaches), several parameters are constructed: divisions of time, cycles, ternary and binary rhythms, oral traditions, collective games, polyrhythms, relation between ‘up’ and ‘down’ and its transcription in the western system of solfeggio. From there on, the class continues with more complex structures from Indian, African and Afro-Cuban traditions, jazz, European folk music and contemporary classical music (Steve Reich, Olivier Messiaen). Rhythm is linked explicitly to the physical experience of space and time. By concentrating intensively on a different performing art, one feeds the relation with one’s own art. The confrontation with texts and theatrical presence can help the student become a more creative, inventive, autonomous or shortly better dancer. Different teachers use very different approaches: some work with existing plays, classic or contemporary, others with montages of texts or material written by the students. Sometimes the process is inherently collective; sometimes it starts more from the individual participants. But all approaches stress on the quality of acting, the ‘credible’ performance of texts and finding an open relation between character and performer. In the 1st year, the aim is to let the student find calm and security is saying texts on stage. The student feels the gaze of the audience, but there is no way out through dancing, there is only text. In the 2nd year, the workshop builds further on the achievements of the previous year, but the material becomes more complex and challenging for the personality of the student. The course treats the main paradigms of the history of theatrical dance. Within each period, a number of historical cases (choreographers, forms, styles) are unfolded with the help of theoretical notions such as body, figure, spectacle, avant-garde, the sublime, expression, ritual, simulacrum, musicality and dance, thinking-concept-movement, spectatorship and participation. 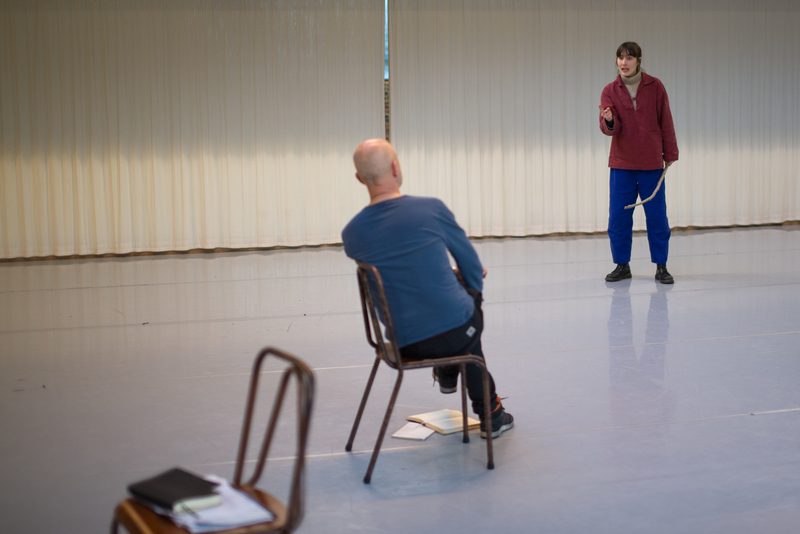 In the 2nd year an additional seminar is spent on contextualising the early work of Anne Teresa De Keersmaeker, linked to the composition workshop that works on this theme. In addition to the Trisha Brown repertory workshop, there is also a short seminar contextualising her work. The philosophy classes do not aim at offering a compendium or encyclopedic overview of the history and main topics of philosophy, but start from a specific topic that is in the heart of the research of the teachers. Through the discussion of this topic, links to the history and structures of philosophy are naturally made. Topics range from aesthetics to political philosophy. Next to the classes, students also have the task to write a paper, with every year a different stage in its development. In the 1st year, the introduction discusses basic concepts such as class, role, social ritual, institution, institutional differentiation, rationalisation, and also refers to classical sociological approaches and topics, such as the individual and consciousness as a black box, or theories of globalisation. In the 2nd year, the sociology course focuses on the cultural field, through an institutional analysis of the structure and evolution of the Western art system. Another course in the 2nd year focuses on gender theories. In the performance analysis classes, students develop a vocabulary to discuss performances they have seen live or on video. The goal is to refine their reflection and discussion of art works, to go resolutely beyond ‘liking’ or ‘not-liking’ as the start of an analysis of an artwork. In the ‘management’ course, students learn to know and discuss about important elements of the organisation of professional life, such as production, organisation, touring, co-production, partnerships and curating, but also about time management, public funding.